In 3-quart saucepan, combine broth, water, carrots, celery, contents of seasoning packet from soup mix, gingerroot, lemon peel and pepper. Bring to a boil over medium-high heat. Cook 1 minute. Add broken ramen noodles and pea pods; mix well. Reduce heat; simmer 2 minutes. Stir in shrimp. Cook 3 to 4 minutes or until shrimp are pink and firm and soup is thoroughly heated, stirring occasionally. 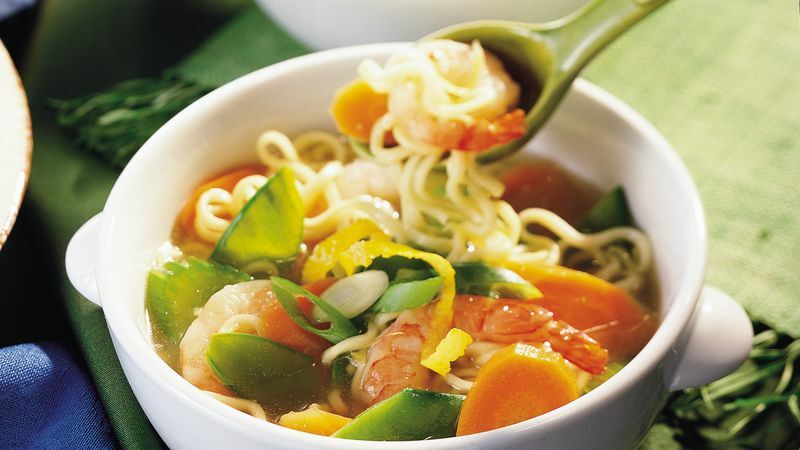 Make this soup even quicker by using cooked shrimp, adding them right at the end of the cooking time. They need to cook only 1 to 2 minutes, just long enough to heat them.